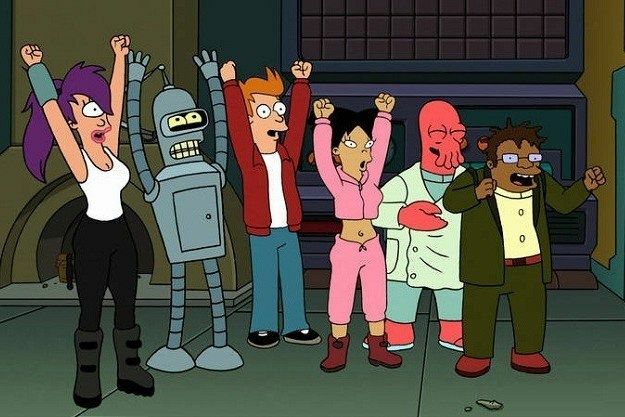 The cast of Futurama definitely wins the non-existent Comic-Con award for fan appreciation and involvement. The panelists not only revealed a look at an upcoming episode, but treated the audience to a drawing contest between creator Matt Groening and director Steven Sandoval. They even rewarded the fans in the audience who were dressed as Futurama characters by handing out swag and signed drawings by Groening himself. Panelists also included Lauren Tom, Maurice LaMarche, Billy West, John DiMaggio and writers Patrick Verrone and David X. Cohen. Hit the jump for my full panel recap and be sure to keep up with all of our continuing Comic-Con coverage here. The panel opened up with an eight-minute look at an upcoming episode. The familiar animated opening was changed into a live-action puppetry one, much to the audience’s delight. The episode revolved around the Professor wanting his crew to get some well-deserved R&R, so they all travel to Oktoberfest. While Fry is ready to get drunk and stupid on German beer and food, Oktoberfest has apparently morphed into a stuffy celebration of how far humanity and civilization have come. Fancily dressed attendees sip beer from tiny steins and immediately expectorate the contents into a spitoon (which Fry later chugs to get drunk). An interesting side story involves Bender entering a sausage making contest. His competition sports such exotic meats as angel wings and hummingbird meat, while Bender only has a “Craigslist pig.” This spurs Bender to go in search of a 30,000 year old mammoth. Everything is going fine until it appears that Fry has fallen into the meat grinder. Cohen: We’re still on the air! (cheers) We’ll once again be on the air next year! Tom: On next week’s episode, Amy gets addicted to drugs, dresses like a skimpy butterfly and makes out with Fry. DiMaggio: Bender goes Fox-hunting with guest star Patrick Stewart and discovers the fox is a poor, helpless robot. LaMarche: Dr. Zoidberg ends up on the wrong end of the mafia when he steals the Don Bot’s cash. West: Professor Farnsworth confesses that his parents are still alive. 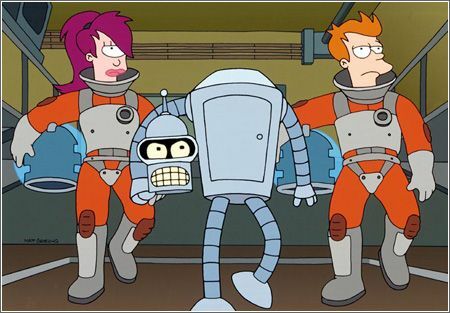 Was Fry’s destiny planned from the beginning? Groening: It was planned. We had a plan…right? Cohen: But now we’ve used up that plan. But we had a list of things we wanted to get to. How long does it take to draw the characters? Sandoval: Bender is simple to draw, Amy is the toughest. After drawing them so much, it becomes second nature. Anywhere from 1-5 minutes. Verrone: Because of the paradox from Bender’s Big Score, we needed to keep Nixon in power. I admit that there is a time-travel paradox and one of the time travelers had to die, so we had to make Travers disappear…literally. There was also a presidential election episode where a character didn’t have an Earth certificate to confirm his identity; he was actually born a woman and the writers didn’t think the audience was ready for a time-traveling transvestite. A fan dressed as a convincing Zoidberg asks a question: Is Zoidberg gonna get some action soon? West/Cohen: Zoidberg will get some action next summer. He deals with his personal body odor issues by falling in love with a woman who can’t smell. When asked if the cast members received any weird mail/hate mail, Sandoval responds that Futurama fans aren’t haters. Not sure if Comic-Con…or keg party in District 9. Not sure if San Diego Convention Center…or just a small wing of Matt Groening’s house. 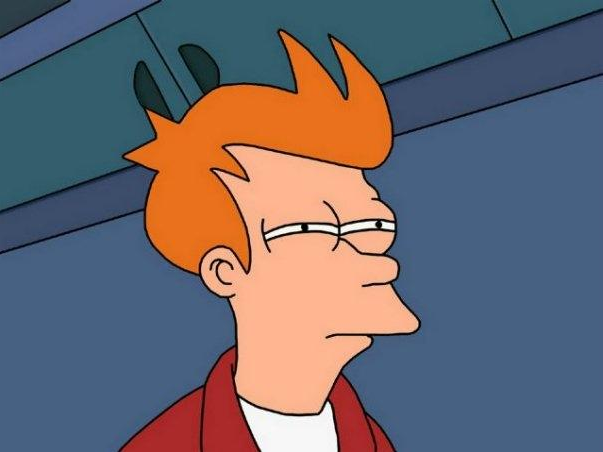 Not sure if Futurama panel…or just a room filled with 5,000 of the world’s most attractive geniuses. Sandoval vs Groening – Groening cheats by starting ahead. 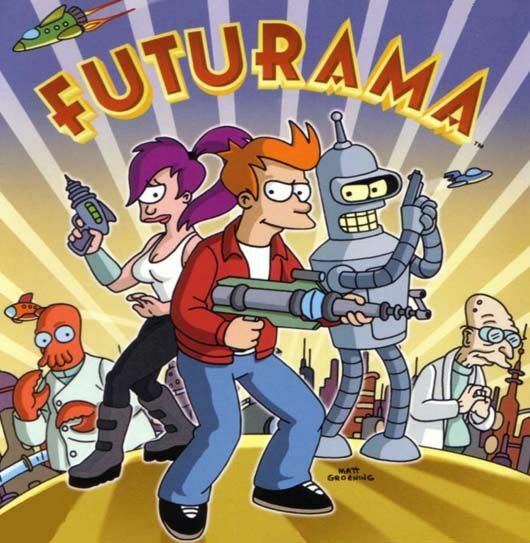 John DiMaggio, Billy West and Lauren Tom narrate. Groening draws 5 images in the time it takes Sandoval to do one. Groening reveals a secret hidden (already completed drawing by Bill Morrison) on the last page, while Sandoval’s Leela wins the audience’s approval. Groening receives the Comic-Con Icon award (past recipients include Neil Gaiman, Ray Bradbury, George Lucas and Frank Miller). The panel closed out with more footage from the upcoming season and included scenes of Amy and Leela completely roided out and intimidating the guys, Zoidberg as a squid who is quickly eaten by a predator, Professor Farnsworth as a horny turtle and Amy and Leela dressed in butterfly costumes in some sort of gladiatorial games where they are tossed into a bug zapper. Welcome back, Futurama. We missed you. Be sure to keep up with all of our continuing coverage of Comic-Con here.